We’d love your help. Let us know what’s wrong with this preview of The House at Tyneford by Natasha Solomons. To ask other readers questions about The House at Tyneford, please sign up. I am a musician but not a violist. I tried to play Concerto in D on the piano using the viola music at the end of the book but was not successful. I googled the piece "written by Jan Tibor"...no luck. Anyone know where I might listen to this piece? Obviously I loved the book. Like Downton Abbey? Sweepingly romantic? Beautifully written? None of the above. First, the only reason this has been compared to Downton Abbey is that it takes place in a country house in England and characters from upstairs and downstairs are big. That part of the premise is similar - the same. But there's none of DA's biting humor, or quick-sharp plots, or characters you love or love to hate or just hate. "The House at Tyneford" is...well...boring. It gets off to a sssslllloooowwww start, and t Like Downton Abbey? Sweepingly romantic? Beautifully written? None of the above. It gets off to a sssslllloooowwww start, and then lotsofthingshappenatonce and thennn we're back to the ssssslllooowwww. And then lotsofthingshappen a n d t h e n nothing...........for a veeeeeeeeeeeeery loooooooong tiiiiiiiiiiiiiime. Anyway, so then it ends. Warning: big spoiler. (view spoiler)[Elise ends up with MR. RIVERS, the FATHER of her DEAD LOVER? Um, I'm sorry, but ew.) (hide spoiler)] No thanks...but that takes care of the sweepingly romantic bit, although it's more like brushingly mushy, and I have to say, I think that's weird . As for the writing, well, I was hideously disappointed. If the writing had been better, this whole book might have been really good. As it was, the gratuitous, clumsy descriptions seemed more suited to a young adult novel (a bad one; cough, Meyer) and the dialogue was occasionally unbearably stilted. All the elements of a great book are here - Natasha Solomons, being a not-great writer, couldn't pull them all together. 1. The main character, Elise, is absolutely unlikable. Her own family kind of doesn't like her, and it's not in that heart-wrenching, Jacob Have I Loved way where you feel like shaking them and yelling, "she's better than the lot of you, you idiots!!!" No. I don't blame them for not liking her. She whines about her lack of musical talent in an exceptionally musical family. She calls her parents Audiobook. 1. The main character, Elise, is absolutely unlikable. Her own family kind of doesn't like her, and it's not in that heart-wrenching, Jacob Have I Loved way where you feel like shaking them and yelling, "she's better than the lot of you, you idiots!!!" No. I don't blame them for not liking her. She whines about her lack of musical talent in an exceptionally musical family. She calls her parents by their first names (sorry, I never got over that, not through the whole book). She doesn't like her sister and then is surprised that her sister doesn't like her. Outside of her family, Elise continues to be unlikable. I felt like all she ever did was shriek at other people and expect them to help her and save her and love her when she had done nothing to deserve it. For example, her only chance at getting out of soon-to-be-German-occupied Austria is to sign on as a housemaid at an estate in England. Her Austrian housekeeper gives her a treasured English-language housekeeping manual in the hopes that it will help Elise learn both the language and some essential housekeeping skills. If I were her, and my physical safety and well-being depended on my being able to hold down a job in England, you can be dang sure I would be reading that book every single night until I had it memorized. Elise, though? She just tosses it aside. Whatevs, no biggie. She is both stupid AND lazy. UGH. 2. The two central relationships in this book fall flat flat flat. With all her shrieking and being stupid and lazy, I could never figure out her feelings regarding Kit. She was always wavering and stuttering and tripping over her poor English grammar and as a result, I never knew if I was supposed to be rooting for her or not! I get the idea of understated affection, but yeesh, this was like dealing with an annoyingly passive-aggressive friend who expected you to figure out her every whim and emotion just by reading into her sulky moods. 3. Not once, but TWICE in this book, people declare that someone else is dead without having any evidence whatsoever that this is so. They just "know" it, or "feel" it. Not good enough, book. 4. On the other hand, sometimes people in this book just "know" something good is going to happen or "feel" it, against humongous piles of evidence to the contrary. Humongous. Piles. Of evidence. 5. Sometimes things in this book that were written on the page, were not actually happening. This got really annoying, really fast. 6. Can someone please explain to me what was with the novel in the viola? The author herself seems unable to do so. I do not understand a) why Margot was so upset about it; and b) how the pages came to be blank...? 7. The descriptions of the English countryside were lovely. They really were. But there were far, far too many of them. The action of this book moved in fits and starts: something relevant would happen, and then paaaaaaages of nothing. Repeat repeat repeat. 8. Finally, I found this book to be very predictable. From the first time a certain two people met, I knew exactly what was going to happen. I very much enjoyed this. It's imperfect, sure -- the author is a little obsessed with foreshadowing to such a degree that almost nothing is a surprise -- but it has the most beautiful sense of place. Tyneford is lovely, and it's not just the description of the town, but the characters within it. I see a lot of people complaining that this is NOT Downton Abbey-esque as the jacket/marketing promised, and I guess it isn't in the upstairs/downstairs sense, but I thought this did a beautiful job of I very much enjoyed this. It's imperfect, sure -- the author is a little obsessed with foreshadowing to such a degree that almost nothing is a surprise -- but it has the most beautiful sense of place. Tyneford is lovely, and it's not just the description of the town, but the characters within it. I see a lot of people complaining that this is NOT Downton Abbey-esque as the jacket/marketing promised, and I guess it isn't in the upstairs/downstairs sense, but I thought this did a beautiful job of outlining how the wars impacted that lifestyle -- something Downton touched on a great deal in season 2, albeit with WWI (and maybe season three?). I know, tiny violins and all, but I think both illustrate the old "money can't buy you happiness" adage. By-the-way...The "f" word was written into the book many times...especially towards the end! Again, TODAY'S worldly standard...NOT back then! Ainda que com algumas semelhanças com a série (período histórico e plano de acção), este romance de Natasha Solomons é completamente original. A protagonista, Elise Landau, é ainda uma jovem, imatura e mimada, quando é forçada a deixar o seu país, a sua família e a vida privilegiada da alta sociedade austríaca para servir como criada numa austera mansão inglesa. Consigo leva apenas um violino, cujo interior guarda o último romance escrito pelo pai, e o colar de pérolas da mãe, símbolos da sua antiga vida. Ao longo das mais de 400 páginas deste romance embargamos, junto com Elise, numa viagem onde vamos conhecendo a Inglaterra em plena 2ª Guerra Mundial, a perseguição aos judeus e o avanço alemão pela Europa a dentro. Assistimos às venturas e desventuras de Elise, uma imigrante judia que não encontra o seu lugar: a sua educação e hábitos da classe alta não permitem que seja uma criada como os demais, e, enquanto criada, também não tem lugar na aristocracia inglesa. Ainda que a história deste romance pouco tenha a haver com "Downton Abbey", é me muito fácil reconhecer, no livro, as personagens que dão vida aos criados na série. Este é um daqueles poucos livros em que a mestria da autora nos permite, mais do que ver, sentir. Conseguimos sentir a areia e a relva húmida sob os pés, cheirar a brisa salgada do mar e a terra húmida após a chuva. Este foi um livro que, já antes de acabar de o ler, lamentava a rápida passagem das páginas que me aproximavam do fim. Poucos foram os livros que me levaram às lágrimas e este foi um deles. Todo o drama de Elise, da sua família e mesmo "família" inglesa é tocante para além de que retrata um drama que podia muito bem ter acontecido. I loved The Novel in the Viola. It is one of those books in which everything – characters, emotions, settings, writing, period, storylines – is right. And everything works together beautifully to produce a book that is far more than the sum of those parts. At heart though, The Novel in the Viola is the story of a life. The life of Elise, younger daughter of Anna and Julian Landau. Opera singer and novelist respectively. Elise worries that she is not as talented as her sister, Margot, but that cast I loved The Novel in the Viola. At heart though, The Novel in the Viola is the story of a life. The life of Elise, younger daughter of Anna and Julian Landau. Opera singer and novelist respectively. Elise worries that she is not as talented as her sister, Margot, but that casts just a very small shadow on a wonderful life. Because Elise is loved, and because she loves her family, she is happy and she is secure. But the year is 1938. The Landaus live in Austria, in Vienna. And they are Jewish. VIENNESE JEWESS, 19, seeks position as domestic servant. Speaks fluid English. I will cook your goose. Elise Landau, Vienna 4, Dorotheegassee, 30/5. A position is secured and Elise is despatched to London. A temporary arrangement, to keep her safe until things change, until the family can be reunited. Elise, her family, her world were alive for me, and I felt her sorrow as she was separated from them. I admired her character as she coped with the journey, the things she had to do in London. I empathised with her as she worried about making her money last, as she devoured the chocolate her sister tucked into her luggage, as she struggled to cope with the separation from her family and her home. Or, to put it simply, I grew to love Elise. She becomes a parlour maid at Tyneford House on the Dorset coast. During her life there she will experience both love and loss. She will make friends, and grow to love the house and the surrounding countryside. But she will also suffer slights and setbacks as she tries to find her place in the world, and reunite her family. The slights come because Elise doesn’t quite fit. She plays the part of a parlour maid but she comes from the world of the family. The butler observes that, after Elise, Tyneford would never be the same again and he is right, for more reasons than he knows. It would love to write about so many wonderful details, characters and events, but I mustn’t. This is a book that needs to unravel slowly, so that you can watch over Elise as her life progresses. The settings, from Vienna to London to Dorset, are wonderfully painted, and the sense of period and the point in history too are never lost. The characters, and their relationships, are fully and beautifully drawn. I believed in them utterly. That meant that I was completely involved as Tyneford House and its occupants faced both war, and the end of an era. Things would never be the same again. I knew that. I had the benefit of hindsight, and that made the story so much more moving. It was such a wonderful story, so beautifully written, and with such a range of emotions. I think I felt every emotion that a book can inspire before I reached the end. That end came quickly. Maybe a little too quickly, though it might have been that I just didn’t want to leave Elise and her world. It was unexpected and yet completely right, and it was given extra poignancy by the very real events that it mirrored. A few small things didn’t quite work.Maybe a few too many nice, understanding characters. One or two modern idioms slipped in. And the story of the actual novel in the actual viola didn’t quite work for me. But they were small things, and I could happily let them pass by, because the many delights of this novel made them seem unimportant. And because The Novel in the Viola really is a book that can touch your heart, if you only let it. And, as I said, I loved it. In general, I'd say it was a disappointment, mainly because the story was highly predictable and not original in its set-up at all. The gist of this story has been written before, much better and more enthralling. Think Jane Eyre, for example. The protagonist, Elise/Alice, is an omniscient narrator who gives away clues about events that will take place 100 pages later in such a way that even a mildly experienced reader knows exactly what's going to happen. The three main events that carry the sto In general, I'd say it was a disappointment, mainly because the story was highly predictable and not original in its set-up at all. The gist of this story has been written before, much better and more enthralling. Think Jane Eyre, for example. The protagonist, Elise/Alice, is an omniscient narrator who gives away clues about events that will take place 100 pages later in such a way that even a mildly experienced reader knows exactly what's going to happen. The three main events that carry the story were all three clear to me after about 80 pages... Why?? Why does the author break up the story and take away every dynamic within the story by making it so utterly - and irritatingly - predictable? It beats me. The only reason I continued to read (scan) the book is because I warmed to the characters and enjoyed the ample descriptions of the beautiful English countryside. Confession: I was in one of my favorite bookstores, Denver’s The Tattered Cover (AKA: A piece of heaven!). One of the things that I like about the Tattered Cover is that it always has interesting displays that pique my interest—even if the display is on a subject that is not usually of interest to me. So, when I saw the display of books that said, “If you loved Downton Abbey, you’ll love these” (or something like that), I was there. I loved Downton Abbey, despite the fact that my brother and sister-in-law accuse it of being boring. That doesn’t hurt me. My brother rarely likes what he calls “good books." His denigration actually makes me want to read or watch something more than I otherwise would have. Maybe I’m just contrary. Probably. Anyway, I was ready to devour Natasha Solomon’s novel about a Jewish girl from the Austrian bourgeoisie set who takes a job as a maid in 1938. She makes her way across the sea to a remote part of England and tries to make herself at home in the “downstairs” section of an English country manor. She finds this difficult, having ordered around servants herself at one time. I don’t want to give away too many details, but I did enjoy this world. It literally portrays the fall of the minor English aristocracy. The book is full of dark shadows, juxtaposed with the last pulse of light from an era that has been slowly expiring for the last three decades. I love Solomon’s characters. Elise is likable, even when she pouts. Kit is intense in his boyish playfulness, but has an unwavering dedication to duty. The Landaus were the most interesting couple of the story; she an opera singer, he a novelist. I would have liked to have spent more time with them in Austria. I liked the novel very much, but for me it was not like “Downton Abbey." If I were to compare this to a novel, I would say that in some ways, it reminded me of Daphne DuMaurier’s “Rebecca," but only nominally. This is not a mystery, but it is a memoir; both books open with a dream of a grand old manor. A escrita da autora é fluida, directa, clara, emocionante e cativante. A leitura é empolgante, deliciosa, compulsiva, viciante e fascinante. A Segunda Guerra Mundial para mim, é a minha época favorita de leituras, não pelas atrocidades que se passaram, mas por toda a história à volta dela. Sou apaixonada por este período por não conseguir imaginar que “aquela” pessoa era tão maquiavélica ao ponto de matar tantos inocentes, uns porque eram judeus, outros porque não eram Arianos. Para Hitler só a raça pura ou superior (Arianos) tinham o direito de dominar as raças ditas inferiores. Aos judeus não era permitido casamento com alemães pois corrompiam a raça pura, por isso a perseguição e o extermínio destes membros. A narrativa situa-se entre os anos 1938 e 1945 e é nos relatada pela própria personagem. Elise é uma jovem judia que é separada da família e para sua segurança vai morar como criada para casa de uma família aristocrática em Tyneford na Inglaterra. Elise vai viver diferentes pessoas e vai amar mais do que uma vez. Enquanto a história nos é descrita, a autora brinda-nos com alguns flashbacks pelo meio e assim vamos conhecendo melhor a Elise criança. As descrições, os diálogos, os ambientes, os detalhes e as situações vividas estão tão bem relatadas que me senti a viver a vida da personagem. Qualquer leitor fica rendido a esta maravilhosa narrativa, quer goste desta época da história ou não, porque a maneira como a autora expõe as situações, ninguém consegue ficar indiferente. Para finalizar dou os parabéns à autora Natasha Solomons e às Edições ASA pela maravilhosa história e pela magnífica capa. 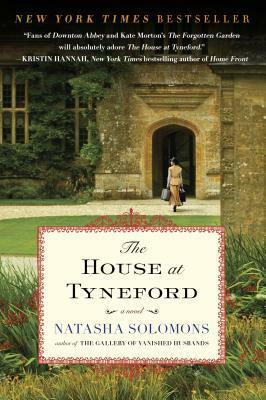 Skipping the summary of the novel itself, I found The House at Tyneford while browsing Amazon and finding that it was highly rated, was similar to Downton Abbey, and an interesting premise. I can tell why the book would be recommended to those who enjoy the show Downton Abbey, and for the first half of the novel the story was interesting. Elise's life from Viennese bourgeois to maid was interesting enough to keep me reading, and Solomon's descriptive writing never overshadowed the plot. That bei Skipping the summary of the novel itself, I found The House at Tyneford while browsing Amazon and finding that it was highly rated, was similar to Downton Abbey, and an interesting premise. I can tell why the book would be recommended to those who enjoy the show Downton Abbey, and for the first half of the novel the story was interesting. Elise's life from Viennese bourgeois to maid was interesting enough to keep me reading, and Solomon's descriptive writing never overshadowed the plot. That being said, I actually didn't finish reading this book in its entirety. I got to a point in the novel that turned me away from it completely and decided to skim the rest, which is why I'm giving it only 2 stars. The book was both heartbreaking, breathtaking and lovely at the same time. You know it will be sad when the heroine is a Jew during WWII but I still cling to hope, it could happen. The ending itself is bittersweet and fitting and could have made me cry. The story is about Elise who becomes a maid in England just before the start of the war. Her mother is a famous opera singer, her father an obscure novelist. She is not fit for service really, but does her best. her luck is the household she ends The book was both heartbreaking, breathtaking and lovely at the same time. You know it will be sad when the heroine is a Jew during WWII but I still cling to hope, it could happen. The ending itself is bittersweet and fitting and could have made me cry. The story is about Elise who becomes a maid in England just before the start of the war. Her mother is a famous opera singer, her father an obscure novelist. She is not fit for service really, but does her best. her luck is the household she ends up in, good Mr Rivers who took a chance on her. Friends she meets and then there is Kit. It is a new era, but there are still things you just do not do, and a servant and the young master of the house is one of those things that can't be. Here comes the romance and friendship. But over all this is the shadow of war and him being young we all know what that means. The war is looked at from the sidelines. A shortage of things, German planes in the sky, the army taking over more and more land for their own purpose. The house becoming more and more empty as men leave for war and women for factories. In that the book is rather silent in a way, it does not scream and shout that the war is here. Instead it breaks your heart a piece at a time. And my heart did feel like it was breaking a few times. There is this balance between happiness and hope. A balance that makes it impossible for me to put the book down. I just wanted to read, I just needed to know. Would everyone be happy in the end? It was a truly lovely book that I just fell more and more for while reading. And I still think about it while writing this. I read this for one of my reading groups and found it fairly good historical fiction. It stands out as yet another story derived from the global event called World War II. I don't suppose we will run out of tales about that for a good long time. Elise Landau is 19 and forced to emigrate from Vienna to England in 1938 because she is Jewish, her father is a novelist out of favor with the Third Reich, and her parents want to keep her safe. Apparently, many young, affluent girls escaped Europe on a domestic service visa to Great Britain in those years. Elise had been spoiled by her family's comfortable circumstances in Vienna including a rich social life due to her mother's status as an opera singer and her father's fame as a novelist. Arriving at the Tyneford House on the wild Dorset coast, she found it difficult to adjust to being a servant rather than being served. In truth, the story was like The Secret Garden for adults. The writing is nicely done, except for a tiresome tendency of the author to begin each chapter with a page of description. Fortunately Ms Solomons writes well about the beauties and fitful weather of the area. Most of my fellow reading group members found it improbable and even cringe inducing. Elise and the son of this family fall in love, so she rises from her servant station to family member. Because of the war, the love affair is doomed. In my view, historical fiction of this sort must include a love story; war usually sends love into disastrous and sad directions; disruption of family life, economic conditions, and treasured traditions is inevitable. The House at Tyneford touches on all of the above. It made me cry once and sob near the end. This title must have come to my attention from somebody's blog because it's just the sort of book my blogging friends like most, a bit like an Elizabeth von Arnim novel with a touch of Rebecca superimposed. The story is based on the experience of the author's great-aunt, who as a young woman left Vienna for England before World War II and worked as a domestic at an English estate. The house and village that the fictional Elise comes to love are also based on a real story, that of the lost villag This title must have come to my attention from somebody's blog because it's just the sort of book my blogging friends like most, a bit like an Elizabeth von Arnim novel with a touch of Rebecca superimposed. The story is based on the experience of the author's great-aunt, who as a young woman left Vienna for England before World War II and worked as a domestic at an English estate. The house and village that the fictional Elise comes to love are also based on a real story, that of the lost village of Tyneham on the Dorset coast. It's a lovely story about a wealthy Jewish family in Vienna who have realized by 1938 that they need to leave their beloved city. One daughter, a musician, and her husband, an astronomer, leave for California where a job teaching is waiting for him. The younger daughter, the protagonist of this novel, Elise Landau, is taken on as a parlormaid in the house of the Rivers family in Dorset. The parents are awaiting a visa which will allow them to go to New York where the mother, an opera singer, and the father, a well-known Austrian novelist, can make a new life for themselves. But things don't go as planned and even as Elise begins to feel at home in England and falls in love with an Englishman, she worries about her parents as their visa is delayed and they find themselves trapped in Austria. The novel is pastoral, with scenes of haying and loving descriptions of the birds and flowers of the English countryside. Elise is with the fishermen as they bring in their first mackerel catch of the season. She comes to admire the grey stone walls and cottages of the village and the golden stone of the Elizabethan manor house. Until the violence and reality of the war intrudes on their little valley and threatens everything Elise has come to love. As I'm currently watching the second season of "Downton Abbey" on PBS, this novel fit quite well with my current mind set. The story begins in Vienna, where our main character Elise Landau is living the good life with her family. Her mother is a singer and her father is an author and they decide to send Elise, who is 19, to England to escape the occupation of Austria by the Nazis. The family is Jewish and they plan to eventually meet up in America when the rest of the family can secure visas. Eli As I'm currently watching the second season of "Downton Abbey" on PBS, this novel fit quite well with my current mind set. Elise is able to secure a job as a parlor maid in a grand estate in Tyneford on the coast of britain and the story unfolds from there. Uma das editoras que mais me tem vindo a surpreender pela riqueza das suas histórias é ASA. São histórias com uma rara beleza, descritas através vidas que se traduzem em romances credíveis e com uma escrita cuidada, são oportunidades de leituras extraordinárias e que eu vou recordar durante muito tempo. Depois em 2012 ter descoberto A Menina da Falésia (opinião) e O Segredo de Sophia (opinião), heis que 2013 me estreio nesta editora com Uma Casa de Família, uma narrativa perfeita em todos sentid Uma das editoras que mais me tem vindo a surpreender pela riqueza das suas histórias é ASA. São histórias com uma rara beleza, descritas através vidas que se traduzem em romances credíveis e com uma escrita cuidada, são oportunidades de leituras extraordinárias e que eu vou recordar durante muito tempo. Depois em 2012 ter descoberto A Menina da Falésia (opinião) e O Segredo de Sophia (opinião), heis que 2013 me estreio nesta editora com Uma Casa de Família, uma narrativa perfeita em todos sentidos que compõem um romance contemporâneo e que me enterneceu profundamente, intensamente, ao longo do folhear das suas páginas. A Segunda Grande Guerra é, e por toda a minha eternidade será, um tema tocante, difícil de deglutir pelos tantos, imensos, incontáveis, amores e vidas que quebrou. Foi o princípio de um fim que, mesmo sem real finitude, ainda hoje toca as consciências e os corações pelo sofrimento deixado a todos os que existiram entre 1939 e 1945. Ninguém ficou imune e, para não me dispersar ainda mais no meu comentário, digo-vos que o alguém que inspirou esta belíssima, encantadora, narrativa não foi excepção. É, na minha perspectiva, muito difícil não ser e não amar Elise ao longo deste texto. Não nos deixarmos maravilhar pela sua Viena resplandecente de melodias, arte e sabores, e, mais tarde, não nos perdemos na sua paixão e novos amores, mais agridoces, mais intensos, permitidos apenas a quem experimentou, entre a verdadeira dor, o canto dos afortunados num recando edílico perdido nas Ilhas Britânicas. Para ser mais concreta, fala-vos de uma menina-mulher de classe alta que, na eminência da calamidade no parágrafo acima referida, se viu obrigada a abandonar tudo o que conhecia, se viu obrigada a romper com todas as suas concepções e, mais difícil ainda, se viu obrigada a deixar para trás os que amava para sobreviver. Fala-vos de uma menina-mulher que aprendeu de maneira abruta, penosa, a encontrar dentro de si coragem, força e resistência para crescer e suportar uma nova realidade que mudou todas as vidas. Falo-vos de Elise, uma grande mulher, uma grande protagonista que personifica todos aqueles que, não estando no centro da guerra, carregaram em seus braços, estoicamente, arduamente, as lágrimas, o medo e a emoção forçadamente ofertada àqueles que conhecem a eterna saudade. Não se iludam, embora esta não seja uma história de repleta de finais felizes é, isso sim, uma história de pequenas conquistas e alegrias, de crescimento emocional e psicológico, onde há lugar para primeiras vezes em todos os sentidos. O quadro onde esta obra ganha luz é, por si só, de uma excelência e complexidades deslumbrantes. A bucólica comunidade e estrutura Tyneford, uma janela distante para o sofrimento, permite-nos usufruir, apenas com um ligeiro aperto no peito, das vidas que aí de desenrolam. São vidas que se regem por hierarquias intrinsecamente vinculadas à cultura inglesa, onde cada um tem um papel que deve desemprenhar com zelo para manter a estabilidade, naqueles tempos ameaçada. Claro que tudo era mais fácil se tivéssemos sido educados para fazer parte desde minucioso retrato. Elise não foi. Para lá da personagem principal que, tal como a sinopse anuncia, vive mais do que uma vida e dos quadros espaciais, de lugar e de época, onde se desenrola acção, é importante ainda referir que esta obra nos oferece uma diversidade enriquecedora de intervenientes que nos permitem ter perspectivas singulares e únicas dos muitos papeis desempenhados na guerra, intervenientes esses que marcam de forma inquestionável o enredo, assim como sublinham as muitas notas que se fazem soar nesta canção que nos embala e nos faz recuar no tempo, de forma plena, e vivenciar as palavras lidas neste livro. Sem dúvida, este é um romance muito muito especial para todos os que apreciam uma boa história onde o todo se conjuga na perfeição – com surpresas e desilusões, com mágoas e sorrisos – conferindo um lugar íntimo à realidade que, com uma peculiar despedida em Ré Menor, deixará certamente saudade e momentos de reflexão. I am very interested in World War II-era stories, especially stores of those affected by the Holocaust. This book starts at the beginning of WW2 in Vienna. Elise and her family have a good life in Austria . Her father is a novelist, her mother is a musician. The problem is that they are Jewish. The family is trying to get everyone out of the country, but they are having problems getting visas. Elise is able to leave the country because she is being sponsored by an English family to come and work I am very interested in World War II-era stories, especially stores of those affected by the Holocaust. This book starts at the beginning of WW2 in Vienna. Elise and her family have a good life in Austria . Her father is a novelist, her mother is a musician. The problem is that they are Jewish. The family is trying to get everyone out of the country, but they are having problems getting visas. Elise is able to leave the country because she is being sponsored by an English family to come and work as a house servant. Being the youngest in the family, it's hard for her to leave, but she does so with the understanding that her family will send for her when they get to America. Elise has never truly worked. Everything has always been done for her, so when she arrives in England at Tyneford, she is in for a rude awakening. Housemaids work from before dawn to after dark. There is never a moment's peace. And it's even harder when you don't speak very good English. Luckily, the squire (Mr. Rivers) is a kind man and has read Elise's father's books. Kit Rivers, the squire's son, is not around much, but when he is, it brings life to the house. Elise has to work through a number of things - learning English, being away from her family, seeking information on her family, as well as just adjusting to a different way of life. She is a source of suspicion from those who visit the house, a source of frustration to the head butler and housekeeper, and a curiosity of sorts for the villagers, Mr. Rivers, and Kit Rivers. The novel follows Elise's life throughout her time in England. I found it interesting to read about what her life was like as a Jew in England and how much faith it took to continue to exist while her family was in such dire straits. Her relationships with the Rivers men are interesting, if unsurprising. My heart ached for her - wanting to know what was going on with her family, trying to find her way in England, and yet dreading the information that could come at any time. But each day, she got up and continued on with her duties and responsibilities, knowing that she is trying to make her parents proud. One thing I found a little distracting was the fact that Elise doesn't refer to her parents as Mom and Dad, it's Anna and Julian. Maybe that's because they were such public persons and she didn't relate to them as Mom and Dad. But it was something to get used to. I really liked this book and would definitely recommend it. A very touching WWII-era story. I found it in a promo section of the bookstore with an "upstairs/downstairs" theme, but I really thought this story rose above this little marketing section. The main character is a young girl from Vienna, a refuge from a respected, artistic family sent to England to work as a servant. As in similar novels, the young Elise falls in love with the charming heir to her new home Tyneford, a beautiful, wild, coastal estate. What sets the story apart is that the main cha A very touching WWII-era story. I found it in a promo section of the bookstore with an "upstairs/downstairs" theme, but I really thought this story rose above this little marketing section. The main character is a young girl from Vienna, a refuge from a respected, artistic family sent to England to work as a servant. As in similar novels, the young Elise falls in love with the charming heir to her new home Tyneford, a beautiful, wild, coastal estate. What sets the story apart is that the main characters are not perfectly one way or another. Elise is neither too innocent nor unsuspecting, she understands the risks of life and the danger she has left her parents to in Vienna. Kit, the son of Tyneford is neither too perfect nor too roguish. His father Christopher is sad and aloof, but not annoyingly so. These seem more like normal people, not novel people, and the story flows much more easily because of it and is not forced. This was a pleasure to read, dealing with the sadness and loss of war of course, but also tells of the ability of people to become more than one version of themselves, as the author so beautifully states. The character Elise changes her name through necessity and also choice, and toward the end of the story describes two photos, of her early life and later life. As to her two names and two lives, she points out "I am happy in both." The year is 1938 and Elise is an 18 year old Jewish woman living in Vienna. She lives a glittering, party filled life with parents who are very well to do and introduce her to many things in that great city. She is well read and educated. It is the start of Hitler's assault on Jews and her parents send her to England to work as a handmaid in a large estate, knowing that things will start to escalate in Vienna and they want to keep her safe. When the master of the house's son returns home, Kit, he The year is 1938 and Elise is an 18 year old Jewish woman living in Vienna. She lives a glittering, party filled life with parents who are very well to do and introduce her to many things in that great city. She is well read and educated. It is the start of Hitler's assault on Jews and her parents send her to England to work as a handmaid in a large estate, knowing that things will start to escalate in Vienna and they want to keep her safe. When the master of the house's son returns home, Kit, he and Elise strike up an interesting relationship which will change both of them forever. I really liked this book. I learned a lot about what was going on at that time in England and about children being sent out of Vienna by wealthy parents with the intention that the parents would follow but most never made it out. I enjoyed the character of Elise who was able to adapt to her fate and watched her grow in so many ways. I'm not sure why this book is recommended for people who enjoy Downton Abbey - while it takes place in England during the start of WWII, that's about where the similarity ends. However, I did enjoy the book and would probably give it 3.5 stars. It's not truly four stars in that there are a few things that happen during the story that I didn't think were all that believable, but I think it rated a bit more than 3 stars, which for my personal rating system, is just average and I thought it was bet I'm not sure why this book is recommended for people who enjoy Downton Abbey - while it takes place in England during the start of WWII, that's about where the similarity ends. However, I did enjoy the book and would probably give it 3.5 stars. It's not truly four stars in that there are a few things that happen during the story that I didn't think were all that believable, but I think it rated a bit more than 3 stars, which for my personal rating system, is just average and I thought it was better than that. The book, for me, was a quick, engrossing read. Honestly I rounded up. This had so much potential. It's about this Jewish girl from Vienna and she's been revoked from her rich lifestyle to being a made in England. A gold love interest. But the like 65% in it, just.. So much can fall apart. There was so much disappointment I can't even. Read it though. If you're deciding, just read it up to like page 223 of the book. It was promising. It had a great start, premise. The writing was good. It just go weird. It's ended so poorly I'm more upset abo Honestly I rounded up. This had so much potential. It's about this Jewish girl from Vienna and she's been revoked from her rich lifestyle to being a made in England. A gold love interest. But the like 65% in it, just.. So much can fall apart. There was so much disappointment I can't even. Read it though. If you're deciding, just read it up to like page 223 of the book. It was promising. It had a great start, premise. The writing was good. It just go weird. It's ended so poorly I'm more upset about that then the actual tragedies in the story. Like. Seriously. No adjective or adverb was left un-written; no gerund omitted. Brooks always were “laughing brightly,” or some such. And so stuffed was story with instantaneous imagination, one began to assume (when arriving) the next page and-half were invented from an otherwise reliable first-person young woman. It was a sad novel, and meant to be so. Thicker than a steak, unless you excised the unnecessary froth.